I’m not sure if it’s the kava or ghost stories over dinner, but there’s a slight bristling at the base of my neck as, under a full moon, I navigate my way around the island back to my bungalow. Alone, with a balmy breeze bothering the leaves above, occasional twig snapping and rustle of things unseen from the shadows, the legend of Vanuatu’s Lisepsep, or tree people, doesn’t seem as far-fetched as it had earlier. Given the local Ni-Vanuatu people’s sincere belief, the ‘time-forgot’ quality of Ratua Private Island and the kava’s tranquilising effects, it’s not too hard to imagine a race of long-haired, mischievous creatures living among the island’s numerous banyan trees. After all, the island is already home to a pair of notoriously fussy white ducks, Whoops and Daisy, who waddle around like an old married couple, and the island’s only sheep, Horse, who, as his name suggests, firmly believes he’s equine. Why not creepy tree people? Pausing to watch crabs meticulously dig holes in the wet sand and the moonlight’s hypnotic dance across the ocean’s surface, I imagine a long-limbed Lisepsep crouched on its haunches on a nearby branch and peering down through a curtain of twig-tangled hair. It’s a thought that halts the crab watching and has me heading back to my bungalow at a brisker pace than when I started out. Inside, all thoughts of Lisepsep folklore fade under the energy-efficient globes encased in antique fittings as I relieve my exceptionally stocked fridge of a local Tusker beer and pad out to the day bed where I’m lulled by the evening’s tropical breeze and gentle murmur of the sleeping island. “You’ll be staying in Dog,” our seasoned island host and affable Frenchman Frederick Maclean, whose pedigree includes stints at the helm of Lizard, Bedarra and Hayman Island resorts, enthuses. Watching as the piece of recycled card with DOG in black texta is fastened to my suitcase, I feel a twinge of envy as cards for the more virile-named bungalows – COBRA , TIGER and BEAR – are attached to colleagues’ luggage. Set amid Vanuatu’s scattering of 80-plus islands, the über exclusive luxury retreat of Ratua Private Island sits high above the archipelago’s capital of Port Vila and off the southern coast of Espiritu Santo. Ratua comes into view while we’re skimming across the South Pacific Ocean’s glassy surface, and it is a sight that is pure postcard perfection. Brilliant turquoise waters lazily lap pristine white sands while traditional thatched roofs peek out from tangled tropical jungle and nodding palms. Though not alone in the private island rental market, Ratua’s model of ethical and ecological tourism sets a new standard in eco luxury as it moves towards becoming a self-sustained resort. Adopted on a 25-year lease after it was discovered by visionary French billionaire and philanthropist Marc Henon in 2005, the 59-hectare former coconut plantation is celebrating a new lease of life as the ultimate guilt-free luxury escape. Focused on conserving and preserving the surrounding area’s natural beauty, 100 per cent of the island’s profits are returned to the surrounding communities with an emphasis on health and education. Ratua Foundation’s independent administrator, on neighbouring New Caledonia, meets regularly with local elders and chiefs to discuss the best use of the island’s proceeds. Earlier concerns surrounding the name of my bungalow dissolve as I’m taken to the southern-most point of the island where I discover the Dog-tagged bungalow is canine in name only and clearly the pick of the litter. 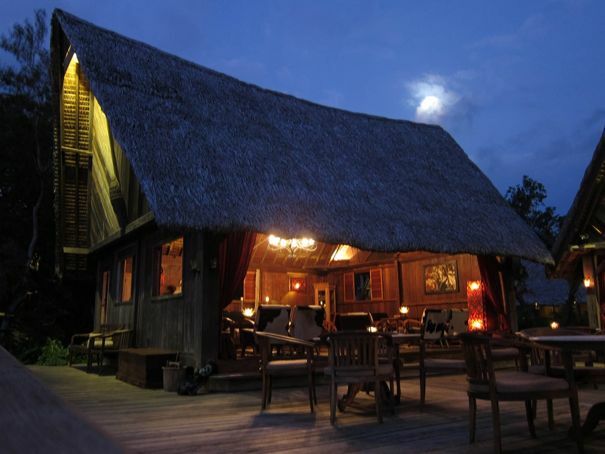 Dubbed ‘primitive luxury’, Ratua teams stunning reconstructed 200-year-old handcrafted teak Indonesian bungalows featuring four-poster beds with 800-thread count sheets, and local beer and French winefilled fridges, the latter coming from Henon’s own vineyards. Metres from the water and offering breathtaking, endless ocean and neighbouring island views, my bungalow consists of a large, beautifully appointed safari-esque bedroom and equally sizeable and impressive bathroom joined by a covered walkway and verandah. Chaise lounges decorate a landing at the water’s edge and the perfectly positioned day bed offers spectacular views over a tiny inlet and sprawling ocean. Comprising three neighbouring ‘villages’ running along the island’s western edge, the resort’s heart, and main communal area, is known as the Yacht Club, where a well-stocked and always open chic teak bar joins beachside and undercover dining, media room, jetty and horizon-viewing chaise lounges. A meandering walkway brings you to the first of 10 private bungalows, equally divided between the West and South Point Villages, that are in the process of being separated by an over-the-water spa. So seamless do the bungalows and buildings blend in with the natural environment that, despite their disassembly, lengthy travel and reassembly on Ratua, the timeless ancient structures feel and look as though they have always been here. Indeed, the island’s free-roaming animals, including horses, chickens, pigs, goats, cows and sole sheep, have no problem approaching the bungalows as I discover while showering one evening and watching several cows helping keep the grass down. Adapting to ‘island time’ occurs, as if by osmosis, when we set our first foot down on Ratua’s jetty and are warmly welcomed by the infectious smiles of staff and Maclean’s Australian wife Victoria. The perfect custodians of this tropical paradise, the Macleans’ relaxed European efficiency and genuine pacific hospitality have us settled and filled with feelings of proprietary for our private island in no time. Similarly, the first of many banquets at the water’s edge sets the scene for the following days and nights with each meal a celebration of the island and surrounding areas’ bounty. Lunch teams freshly baked bread with a smoky, slightly fiery Portuguese-style barbecue chicken, a wonderfully fresh and crunchy coconut heart salad (taken from the centre of a palm frond on a no longer productive or storm-damaged tree) capped off with a glass-lickingly good fresh coconut sorbet – all matched to a flight of premium New Zealand, Australian and French wines. Headed by Vanuatu-born and New Zealand-raised Kandy Tamagushiku, Ratua’s kitchen utilises island-grown fresh organic produce with fresh seafood and local beef, pork, chicken and goat stocks. However, despite the Frenchinfluenced cuisine, quacking companions Whoops and Daisy remain off the menu. Activities abound on, and around, Ratua and since it’s technically your island, you’re free to do as much or as little as you like. And while sipping icy Taittinger from your day bed with a good book is an exceptional way to embrace island life there are many more equally enjoyable pursuits. There’s a whole island waiting to be explored by foot, mountain bike, horseback, electric buggy and boat. A short snorkel out to the island’s surrounding coral gardens reveals the brightly decorated cast from Finding Nemo darting among colourful coral and waving anemones. For the more adventurous a brief boat ride and canoe paddle is all it takes to discover the stunning turquoise wonder of nearby Malo Island’s blue holes. Those requiring a little more action can enjoy the day-long Millennium Cave trek on Espiritu Santo. Combining a steamy jungle trek with canyoning, it’s no easy amble, but the pay-off is definitely worth the effort – just make sure Tamagushiku packs her divine brownies in with lunch as you’ll need the extra energy. Ratua’s latest activity caters to those wishing to try their luck in Vanuatu’s superb sport and game-fishing waters. With the lure of a ‘grander’, a 1,000 pound blue marlin, on your doorstep, a thrilling high-sea adventure awaits on the magnificent 43-foot Cabo sport fisher Southern Destiny. Captained by American Chris Donato, who recently moved from the rich sport-fishing grounds of Samoa to take advantage of game fishing’s next hot spot, the Southern Destiny combines world-class fishing with luxurious private charters. Echoing Ratua’s sustainability ethos, Donato is a proud practitioner of the catch and release of all billfish. While tuna, mahi mahi and wahoo catches are shared between Ratua’s kitchen and the surrounding villages, swordfish, marlin and sailfish are tagged and released as part of The Billfish Foundation program. According to Donato, the days of the must-have marlin trophy for the mantle are waning in the face of conservation and true sportsmanship, and putting a new spin on the ‘one that got away’ story in the process. “You used to hear guys talking about fishing trips and how they caught five marlin, now they’re more likely to say ‘I tagged five fish’. Isaac Wilson, Lexus Magazine March 2010. Click the link below to read the full article, or download it for printing.